Each phase of life has certain words that bring a level of anxiety. Physical Check-up, Report Card, Fiscal Audit, Try-outs, Performance Review, and Tax Return are all concepts that can bring a degree of anxiety or on occasion, fear. Yes, anxiety can be very unhealthy and stressful. It can bring on us a sense of pressure or being overwhelmed and even discouragement. However, when you really stop to think about the process of evaluation, one must admit that if done properly, it can be a healthy process to reflect on where we are with where we would like to be in terms of long-term improvement. The Christian walk is no different. Long term growth comes when there is intentional and honest self appraisal. An inventory of our heart attitude is helpful if we want to see intentional growth. It is not difficult to see that there are two specific extremes that turn into land-mines when it comes to taking a personal Spiritual Inventory. Avoid these two extremes at all costs because there can be catastrophic results! First, is the extreme of seeing it as set of legalistic obligations. If we make the error of looking at the spiritual inventory as a a list of requirements or obligations that must be met to be minimally acceptable in God's eyes, you have made a grave error. Jesus warned his disciples and the Pharisees over and over again of the risks of falling into measuring by legalistic lists of duties and obligations to obtain favor in God's eye's. (See Matt 9: 10-13, Matt 12: 1-13, Luke 11: 37-44) Becoming a slave to a spiritual inventory will lead to legalism. Nothing we do can provide us favor or standing in God's perspective for salvation. Further, nothing we do can keep us in good standing to maintain favor in Gods view i.e. keep us secure. Nothing we do has merit - this is the heart of the gospel. We obtain favor and keep favor because of what Christ has done on the cross. For example, a fastidious daily devotional habit cannot get me into heaven! Nor does my lack of devotional life jeopardize my security of heaven! Works righteousness does not have any merit in obtaining right standing with God. Only Christ's work on the cross is sufficient for our justification. Spiritual Inventories are only a tool to help us gauge our level of growth and commitment in practicing spiritual disciplines after our step of salvation. Second, is the extreme of seeing it as a meaningless and fruitless exercise. In most instances, people avoid appraisal because it means we must confront the realities of our deficiencies and it could require change. Perhaps one of the reasons why people avoid doing an inventory is because no one really wants to admit to the honest truth. For example, when we look in the mirror it is a brutal reminder when you are 30 lbs overweight or your hair-line is receding. We hate it. For some people - the solution to this discomfort is ..... don't look in the mirror! The same goes with the mirror of a spiritual inventory. Seeing ourselves as a person who is ill equipped as a Christian Case-Maker is not a pleasant reality. It has implications.....Perhaps this means that I really don't have a burden for spiritually lost people or I really don't love unbelieving people the way God does or I don't want to challenge myself to ramp up on some basic apologetics skills. Honest appraisal requires a commitment to action and change. Paul mentions repeatedly that each believer needs to regularly examine themselves (1 Cor 11: 23-32, 2 Cor 13:5) making sure that we walk in a manner that is worthy of our calling. This requires an honest self appraisal and spiritual self inventory. No one has 100% of their Spiritual life mastered to perfection. It is simply a part of the sanctification process that takes place over the course of the life of a believer. As you work through each question, give yourself a grade or a mark. The scale above, is useful; Outstanding, Very Good, Satisfactory and Unsatisfactory. Record your findings somewhere in a journal or prayer book to help you record where you are on 01 January 2016. As you enter the new year, ask God to help you change by the renewing of your mind. Jesus reminds us that being a disciple comes at a cost and it should not be taken lightly (See Matt 14: 25 - 35). Enter the new year with a sense of anticipation as to where and how God will change you to be a better disciple. The biggest tragedy that could take place is if you were the exact same person one year from now. Don't be passive - be proactive to become a reproducing Christ follower! Identify and address your weaknesses. As you move through the next year, revisit your list once every quarter just to see where God will lead you in your faith journey. It is helpful if you keep a few things in mind as you work through your inventory. Remember that the inventory is simply a tool not a test. Taking the inventory too seriously could lead to a depressing perspective because no one is perfect and no one can master the Christian walk ideally. However, taking the inventory too glibly could lead to a hap-hazard approach to one's faith walk. In Ephesians 5: 15-16, Paul tells the believers "Therefore, be careful how you walk, not as unwise men but as wise, making the most of your time, because the days are evil." The word translated "careful" is also translated "walk circumspectly" or "walk cautiously", the idea conveyed is with exactness - even piety. Note the level of measurement or intentionality that is associated with one who walks in wisdom. Contrast this with one who is foolish, unmeasured and careless. A spiritual inventory allows you to walk circumspectly. It facilitates wisdom and exactness. Use the tool of a spiritual inventory with wisdom and balance. When you are finished with the inventory, identify areas of strength and areas of weakness that need to be improved. Frequently people with either fixate over things they do well or they will become preoccupied with the the areas that need improvement. Divide the list into two broad areas; + Areas, where I believe I am doing well and ∆ (Delta) Areas, where I believe I need to improve. As you reflect on the list be sure to make it a matter of prayer asking God to guide you as you complete the evaluation phase of the exercise. Praise God for the areas where you are doing well and ask God to to give you wisdom on which ones to focus on for improvement over the next few months. Develop a strategy to address the one or two areas to improve and set forth a plan on how to improve! Don't be consumed with every area where you want to improve but focus your energy on one or two specific areas that you feel convicted about to reshape over the next few months. Be sure to include specific plan on implementation and pray about God changing you over time. As you go through this exercise, do this as an act of worship! Ask God to lead you and to give you great wisdom, insights and discernment. Praying throughout the process is key. When you approach this exercise with a heart of worship it should take any temptation for pressure off. Automatically, it becomes an issue between yourself and God. Desiring to move towards greater levels of obedience and living Biblically is actually an act of worship. It is your gift to God. Paul states in Romans 12: 1-2 that we should present our bodies (our entire being heart, soul and mind) to God as a living sacrifice. When we are transformed by renewing our hearts and minds we are actually in the process of worshiping our great God. The world seeks to see us conform to its image whereas God seeks to see us transform our minds. Remember a transformed heart and mind equals an act of worship. Begin this year with the end in mind. Pray about where God wants you to improve as a Christ follower. Remember what Francis Chan stated - "Life is a series of decisions that results in either reward or regret." Make this year count - invest yourself wisely! Click on the button below to download a pdf copy of a spiritual inventory to use! When we think about the Christmas one cannot avoid the celebration of lights. There is something special about sitting alone in a completely darkened room silently reflecting while watching the glow of the lit candles around your advent wreath. The surrounding darkness permeates the room but the glowing candles that fight through the night penetrate the ever- present blackness. We live in an age of spiritual and moral darkness. Darkness in many respects is the prevailing force in the present world. As I write this article I know of several families who are experiencing significant personal challenges, deep days of darkness, sickness, loneliness, seeming hopelessness situations and to some degree mounting despair. One would like to think it has not always been this way but history tells us the forces of darkness have been the ruling force. Man has had to endure the pain of sin and the pervasiveness of spiritual darkness for eons. The evil acts of tyrannical despots and the wickedness of groups like ISIS are easy to identify. But sometimes it is the acts of people we know in ministry that can be so disappointing. If these are not bad enough, just look in the mirror if you need to see that we all fall woefully short. For centuries, mankind has been longing for darkness to be overcome. Since the fall of Adam in Genesis 3, darkness has prevailed but God promised shortly after the garden ordeal that darkness would be overcome. Jesus is the light that will prevail the spiritual darkness. Christmas is the realization of that promise - the celebration of light. 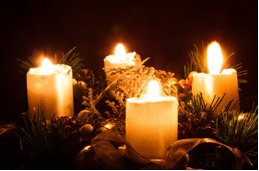 This Christmas be sure to take some time in solitude and reflection, preferably in a room that is lit with a candle or perhaps an advent wreath. Crack open your Bible and take some time with God to reflect on his word remembering this brief study on the word light. The word light appears 82 times in the New Testament. Fifty-eight of those use the Greek word "phos" the most common is used. As you see Christmas lights around your home, neighborhood or city remember the promise, the plan and the purpose of this Christmas and the Advent of our great Savior Jesus. From the beginning God knew of Mankind's great dilemma. Shortly after creation was completed, sin entered the world due to the choices of Adam and Eve. Their sin corrupted the entire universe. Sorrow, adversity, evil and death entered the world all because man disobeyed God. The perfect creation realized in Eden was fully corrupted. Today we experience the compounding effect of sin. Not just the negative aspects of natural fallenness but the haunting impact of volitional sinful choices. Everywhere we look, the corrupting aspect of sin overwhelms us. Sin personally haunts our families, our communities, our Nation, our world and us. However, God made a promise that is recorded in Genesis 3:15. God promised that he would provide a solution for man's great dilemma. The solution is found in the long awaited Messiah and scripture records no less than 15 references where the Messiah would come providing a solution for sin once and for all! John records the actual fulfillment of The Promise! It was the eternal God who made a promise to rescue man from darkness. The darkness of a fallen world and the sin of mankind can only be conquered by the one who provides new life and the one who created the universe. The great news is that the darkness cannot overcome the light that shines in the darkness. Jesus is the long awaited promise and the victor over darkness. Even better, he will ultimately create a new heavens and new earth thus eradicating the effects of the fall on nature. Because of the love of God, He fulfilled the promise to overcome darkness in every dimension. Celebrate His Unconditional Promise! Just as God made a promise, he also had a plan. The plan was to provide a means of redemption for men. A solution for the universal sin problem. The problem with sin is that it is normally committed individually. Sure there are times when an organization or a nation violates people but most often, sins are a matter of personal commission or omission. Sin is destructive. It destroys relationships, it destroys trust and it is also an overt form of rebellion against God. God hates sin and rebellion against him incurs his wrath and judgment. How does God's wrath and judgment become satisfied so that men can be forgiven and restored? God's plan was to send his son to the world to pay the price for man's sin. This is available to everyone who believes! Although men hate the light because they love darkness, John clearly states that those who simply believe is not condemned because he believes in the name of Jesus - the one and only Son of God! For this is the way God loved the world: He gave his one and only Son, so that everyone who believes in him will not perish but have eternal life. For God did not send his Son into the world to condemn the world, but that the world should be saved through him. The one who believes in him is not condemned. The one who does not believe has been condemned already, because he has not believed in the name of the one and only Son of God. Now this is the basis for judging: that the light has come into the world and people loved the darkness rather than the light, because their deeds were evil. For everyone who does evil deeds hates the light and does not come to the light, so that their deeds will not be exposed. But the one who practices the truth comes to the light, so that it may be plainly evident that his deeds have been done in God. The plan of salvation is the forgiveness of sin and the promise of eternal life to those who believe. Although men love darkness and hate the light - God makes a means for people through belief in Jesus' sacrifice in our behalf on the cross! Those who believe enter into the light! God provided a plan. A plan of salvation for all who respond by faith believing that his provision is sufficient. They move from spiritual darkness into the spiritual light! Jesus left no doubt or no question that He was the light of the world and that those who follow him will never walk in darkness. Celebrate His Impeccable Plan! Since the beginning God has sought to redeem people. Because of sin we all are in desperate need of forgiveness. The consuming implications of darkness and its penetrating tentacles into every aspect of life has no limit. People need good news! John the Baptist came to tell people about Jesus! His primary purpose was to point people to Jesus - the Savior! There is little doubt, Jesus made it perfectly clear what his purpose was during his ministry (Luke 19:10) and when he completed his ministry. Spiritually lost people matter to God! The disciples were commissioned to carry the good news of Jesus Christ to a lost world (Acts 1: 4-8). God's purpose and command becomes the A-1 purpose of the disciples! This was their purpose. In fact, the angel appears to them immediately after the ascension and asks "Why do you stand looking into the sky?" as if to say.... you have a job to do... get busy! Go out and be the case-makers you were instructed to be! For centuries, mankind has lived in the abyss of sin without hope. During the angel's announcement to the shepherds in the fields was "Do not be afraid! Listen carefully, for I proclaim to you good news that brings great news that brings great joy to all people; for today your Savior is born in the city of David. He is Christ the Lord." (Luke 2:10-11) Now the light - the good news of the gospel is available to all people! No longer do people need to be a slave to the darkness of sin and separation. God's purpose is to redeem as many as would follow him (John 1:12) so too, it is our purpose to take the message of "the light" into a dark and dreary world. Taking light into darkness - what a royal privilege! Then Jesus spoke out again, "I am the light of the world. The one who follows me will never walk in darkness, but will have the light of life. I have come as a light into the world, so that everyone who believes in me should not remain in darkness. As you reflect on scriptures this Christmas season take some time to reflect on God’s wonderful promise. His plan was to provide a redeemer as well as the wonderful plan. Christ, the light of the world is our means of salvation and our purpose for taking the good news of the gospel to every nation. Perhaps the greatest gift you could provide someone is the light that takes away the sins of the world! The Truth About Thanksgiving, Understanding our Heritage of Gratitude to God. What do you know about Thanksgiving? Yes, there will be turkey, traditional parades and football games - but how much do you really know about the celebration of Thanksgiving in America and why it is celebrated? Tragically, our nation is changing moved by the current trends in media and neo paganism. Here is a brief snap shot of some historical anchors for Thanksgiving that are frequently lost to us. The purpose of this post is to give you a brief walk through history that will prompt you to continue the wonderful tradition of true Thanksgiving, but focus on our great God! William Bradford left England after living in Holland for 13 years with this group of separatists who called themselves Pilgrims landed on what is now the shores of Cape Cod with a total of 103. Landing on November 11,1620 after a 66 day grueling sea journey aboard the Mayflower they land in a barren land without shelter, additional food or provisions. They had intended to land in Virginia but blew off course landing in the harsh winter area of Massachusetts. After a month they move across the bay to what is now Plymouth Bay most of them staying aboard the ship because it was the safest location where they could hopefully survive the winter. After the winter 51 people died of either starvation and/or exposure, William Bradford's wife being one of the victims. In March, they moved off the boat to shore and began to make shelters and homes. An English-speaking Abenaki Indian came to them and the next day he brought another English-speaking Indian named Squanto. Squanto taught them how to forage for food,plant and harvest corn, catch fish from streams and a number of other things. By the late fall of 1621, according to Edward Winslow's account the Pilgrims celebrated their first Thanksgiving after Bradford issued a decree instructing people to gather for the great celebration. Some went hunting for fowl for all to eat. Preparing for a great feast, the pilgrims and some ninety indians including King Massasoit feasted for 3 days. Massasoit instructed his indians to hunt and they brought five deer to the pilgrims to use for their storehouse. On November 29, 1623, three years after landing and two after the first Thanksgiving, William Bradford issued a proclamation of Thanksgiving. In as much as the great Father has given us this year an abundant harvest of Indian corn, wheat, peas, beans, squashes, and garden vegetable, and has made the forest to abound with game and the sea with fish and clams, and in as much as he has protected us from the ravages of savages, has spared us from pestilence and disease, has granted us freedom to worship God according to the dictates of our own conscience; now I, your magistrate, do proclaim that all ye Pilgrims, with your wives and ye little ones, do gather at ye meeting house, on ye hill, between the hours of 9 and 12 in the day time, on Thursday, November ye 29th, of the year of our Lord one thousand six hundred and twenty three, and the third year since ye Pilgrims landed on ye Pilgrim Rock, there to listen to ye pastor and render thanksgiving to ye Almighty God for all His blessings. On this date the they issued The First National Proclamation of Thanksgiving to all colonies. Beginning in September of 1777, the Continental Congress met in York, Pennsylvania. Samuel Adams is credited as the author of the proclamation that was affirmed by the delegates to the Continental Congress. The declaration was crafted because of the military victory at Saratoga, New York. That it may please Him, to prosper the trade and manufacturers of the people, and the labour of the husbandman, that our land may yet yield its increase; to take school and seminaries of education so necessary for cultivating the principles of true liberty, virtue and piety, under His nurturing hand, and to prosper the means of religion for the promotion and enlargement of that kingdom which consiseth "in righteous, peace and joy in the Holy Spirit." An it is furthter recommended, that servile labour, and such recreation, as though at other times innocent, may be unbecoming the purpose of this appointment, be omitted on so solemn an occasion. "I do, therefore, invite my fellow citizens in every part of the United States .... to set apart and observe the last Thursday of November next as a day of Thanksgiving and Praise to our beneficent Father who dwelleth in the heavens.... it is announced in the Holy Scriptures and proven by all history, that those nations are blessed whose God is the Lord... It has seemed to me fit and proper that God should be solemnly, reverently and gratefully acknowledged, as with one heart and one voice, by the whole American people." 1863 was a particularly challenging year during the peak of the Civil War. The battle of Gettysburg had taken a great toll on the nation but it turned out to be a significant victory for the Union. A Thanksgiving proclamation had not been issued by a President since 1815, but Lincoln recognizing the significance of the victory and preservation of the union issues the following proclamation. Finally on December 26, 1941, President Franklin Roosevelt along with Congress pass a law making the fourth Thursday in November an official national holiday of Thanksgiving. The day we know as Thanksgiving has a deep heritage. A heritage of recognizing that God is the source of our bounty. Never forget, these rich traditions and be sure to pass along these historic landmarks on to your children and grandchildren. Have you ever had a spiritual conversation with someone and then had the distinct feeling that you just blew it? On other occasions, you can have a great conversation with someone and it appears as if the dialog went incredibly well, but then you stumble or feel stumped on how to go to the next step. Being a Christian Case-Maker has "hazards" that lurk for all of us in unsuspecting places. To make a correlation, it is a little like the sport of golf... frustrations are sometimes self imposed and while at other times there are "hazards" that loom all around us even when you are fully engaged. You can find yourself in the middle of a hazard with a high level of aggravation. Like evangelism land-mines or boobie-traps that can catch us unprepared. Oftentimes, hazards appear to be strategically placed that require a perfect shot and any deviation will mean you are in for a real challenge! At other times, it is our own poor planning or strategic play that can cause one to land in a challenging situation which can bring anxiety. What if you could prepare in advance for those annoying pot bunkers or water-hazards, or wooded areas before you engage in a spiritual conversation? Avoiding these can help you maneuver strategically and make your spiritual encounter all the more productive and encouraging. If we are not aware of these hazards, before you know it, you could be frustrated beyond imagination. This three part series is dedicated to identifying evangelism hazards that are frequently encountered by your average well intended Christ follower. Special Note: While everyone may not have the "gift" of being an evangelist, everyone should be engaged in the practice of evangelism. The Great Commission applies to all believers, not just a select few who are endowed with specific gifts of an evangelist or a preacher! After all, relational evangelism inherently requires a person to be adept at relational apologetics. Giving a reason for the hope that is within us is commanded in scripture in 1 Peter 3:15-16. Consequently, we all have a duty and an obligation to "be ready" to dialog with our unbelieving friend about our faith in Christ. This paper is written with the concept of relational evangelism (relational apologetics) in mind as opposed to a one-time engagement discussion. So keep this in mind as you read through these hazards that are common to many of us. Being a Christian Case-Maker is really a combination of a person who is adept at relational evangelism and relational apologetics. This post will cover the first three hazards and future posts will deal with the final four hazards. Golf Digest documents that the odds for the average golfer to shoot a hole-in-one is ONE out of 12,750. Oddly enough, some people love to get up to the t-box and just "go-for-it" and let it rip. Somehow, when it comes to evangelism, some have the same perspective...just "grip it and rip it." For years John Daly was known as one of the games biggest hitters in the golf world but rarely did he power the ball to a hole in one shot! When it comes to evangelism while it is possible to hit a hole-in-one shot, it is not probable. Oftentimes, people have the mis-impression that if I just "grip it and rip it" the person will come to faith in one encounter. Frequently, if one tries to hit the ball with all their strength it will frequently hook 50 yards off the fairway into the woods or the rough in a far worse position. In the same way, people don't move from being an atheist or agnostic to a Christ follower in one engagement. Can it happen? Yes. Is this probable or typical, absolutely not! We are far better off understanding that evangelism is more like moving the ball towards the cup through a series of engagements that deal with varying situations and obstacles. Evangelism is a process that takes time, study and evaluation. Where is the person on their spiritual journey? What barriers might be in this persons life that might prevent them from considering the claims of Jesus? The point is that it may take a number of engagements to move the ball towards the desired direction. Each of us needs to consider our unbelieving friends as human beings that have a variety of life barriers that prevent them from seriously considering the claims of Christ. Pressuring people to come into agreement or to make a decision can have negative results. Reliance on the work of the Holy Spirit as the vital agent that moves the person to be open to greater spiritual dialog is imperative. Meanwhile, God uses his agents (us) in this process. Oftentimes, we never consider where our friends are in the grand fairway of life. Rather than adopting a "grip it and rip it" mindset that has our own agenda at heart, perhaps a more loving approach is to see evangelism as a process of engagement that has our friends mind and heart in focus. This takes patience, prayer and compassion. Rarely does one make life altering choices in one hasty decision because of a one-time conversation. We see this concept unpackaged in scripture (Acts 17: 16-18) where Paul was in Athens and he was speaking and reasoning with the religious minded in the Synagogue and with the Epicurean and Stoic philosophers in the marketplace every day. Paul took days if not weeks of dialog with Jews, and the God-fearing Gentiles and anyone who happened to be there! Evangelism is a process. It takes time, effort and patience! Don't fall prey to "grip-it and rip-it" tactics or thinking! So often, people have great zeal to move the ball down the course but they frequently fail to evaluate hazards (or barriers) that can clearly impact progress. You may have known golfers who fail to consider all of the course conditions. In fact, there are times when you cannot see the green or the pin when you tee off. You must know where you are in conjunction with where you want to direct the ball for the shot! If you don't know in advance it can be disastrous. You must know the course conditions, the position of the ball, the location of the green, the hazards in play, etc. It is imperative to study and evaluate the distance, barriers, conditions, and hazards. It is likened to a physician who jumps to the conclusion to treat a patient prior to making an adequate diagnosis of the patients real medical problems. Frequently, disaster ensues. As we build relationships with people, one of the things that we must ask ourselves is "what past experiences, opinions, or viewpoints does this person have about spiritual matters?" When dealing with personal issues as apposed to objects, you are forced to ask strategic questions. A proper spiritual diagnosis requires one to ask strategic probing questions. Questions take time, investment, and patience. (Go to Quest Ministries link "Big Questions") Elsewhere Ravi Zacharias recommends four broad areas of questions; 1) Origins 2) Meaning, 3) Morality and 4) Destiny. The goal is to uncover any emotional or intellectual barriers that a person might have about Christ or Christianity. What has shaped their views, ideas and concepts that has shaped their belief system? Asking the right questions will assist you in understanding barriers or beliefs that a person has about what they believe. Another great resource is Greg Koukl's book Tactics, A game plan for discussing your Christian convictions. If one skips the step of diagnosis it can lead you in a direction that is unfruitful or mis-directed. In most cases, we are far better off asking strategic questions rather than telling them information about the gospel. Artfully and skillfully communicating truth is a key to making people think and process information. Love compels us to be patient, asking strategic and tactful questions. Jesus used this technique all the time! Questions are the key to making a proper diagnosis about their barriers. Again we see Paul engage with the philosophers of his day when he went to the Areopagas and he was able to connect with them because he knew their culture, religious backgrounds, and questions. Paul took time to know what they believed prior to spiritual conversation. He correctly diagnosed the barriers and hazards of the people he was engaged with so that even in the end "some believed." Acts 17 records that Paul earned the right to be heard! The USGA Rule #4.4 states that golfers may not possess any more than 14 clubs when playing a round of golf. Clearly, it is to ones advantage to have all 14 clubs to deal with all sorts of situations. Can you imagine a golfer who uses just one club for a full round of golf? It would be like Three Stooges golf! It might be humorous but it is a comedy of the absurd. Surprisingly, that is the way many people view and practice evangelism. They have one way of communicating about their faith. They use the same line and the same approach time after time. For the lack of a better term they are one club golfers as it relates to evangelism. People using one club (regardless of which one) will typically not work. Additionally, at any given point, golfers must calculate their distance from the pin (hole) and take into consideration the windage, lie of the ball, hazards, course condition, etc. Once the golfer knows all of these variables, he can then select the proper club and then more accurately hit the ball closer to the place where he desires. As in golf, evangelism requires that we make clear assessment of the person's spiritual proximity, receptivity, heart conditions, barriers and then make a proper "selection" of the approach he should use. It also means that one must execute the shots that are required. They make a habit of practicing with each club to achieve the desired outcome. Asking the right question at the right time with the proper attitude can propel the conversation in the right direction. This means that previous preparation, and practice can make a big difference. Sometimes it is not a question or a statement but it could be a simple act of kindness, and other times just being a true friend. Having a working knowledge of practical apologetics will be critical because people will ask basic questions about Christ, the Bible, the problem of evil and so forth. Analyses proves that if you master about 10 questions you will be able to answer 90% of the average person's objections. Knowing how to answer a question is like knowing how to use a 3 iron instead of a 9 iron - each is engineered and designed to overcome a specific challenge. You don't have to be a PGA pro to use the clubs properly but if you are a Christ follower - you are by definition a Christian Case-Maker whether you like it or not! The question is.... how well prepared are you as a Case-Maker? Being a Christian Case-Maker is all about knowing how to deal with various questions that could be thrown your way. Knowing what questions to ask and what answers to give in any given situation is just like a good golfer selects the right iron for the situation. Asking the right questions and knowing their specific barriers enables you to function more efficiently to address the specific hazards that lie in the heart and life of the person you know. Don't get caught using one approach to your spiritual conversations - ask probing strategic questions to understand the barrier AND know how to answer the questions that are presented. This will enable you to be far more effective and conversational with your friend. Scripture again is our standard. Here Peter instructs those who are believers that they need to be ready to give an account for the hope that is within us (1 Peter 3: 15-16)! When it comes to giving a defense of the faith, it requires us to deploy a variety of tools frequently customized to the audience. Our lives must be demonstrably different or attractive so that people wonder "What makes them so unique and their lives so compelling?" We have a grand opportunity to tell people about our hope but also take the initiative to know and understand their objections, barriers or "hazards" that we might encounter! It takes effort to respond with gentleness and respect but Peter gives an imperative to do so! When we do so they get to see unique and wonderful representatives of a great and wonderful God. Being keenly aware of these evangelism "hazards" will make you far more engaging and it will enable you to be used by God in unexpected ways. It does take some preparation, study and prayer but God will honor your efforts to be a Christian Case-Maker when you avoid specific hazards that are oftentimes avoidable. The next articles will deal with four more "hazards" that are common to the average person but often derail spiritual conversations and your aspirations to be a case-maker. Stay tuned for Part II of this series "The Seven Hazards of Personal Evangelism - Hazards #4 & #5!